There was no official announcement, but it would not have surprised me if they had renamed Plano and called it Toyota Town this week. Toyota executives, state and local dignitaries (including Governor Rick Perry) and thousands of locals celebrated the company’s move from Southern California to the city north of Dallas with a fiesta that was pure Texas which is still more than a year away. The relocation of the company’s North American headquarters had been announced months ago, but this was the first event that gave an inkling of what relationship between the city and its newest corporate citizen will be like. Titled “Hello Texas”, the day was all about diverse food from local restaurants, home-grown Texas music and a camaraderie that is reminiscent of Toyota’s relationship with San Antonio, where it has built its Tundra/Tacoma truck plant more than a decade ago. That symbiosis has led to thousands of jobs in North San Antonio, internships and training programs, in-plant supplier business and good-paying opportunities in an area that had been left behind as much of San Antonio flourished. It appears that the interaction with Plano will be the same. Toyota has offered its California employees an opportunity to make the move, but it is believed that many will not. Again, thousands of jobs will be filled in Texas, with entities like Toyota Financial as part of the mix in Plano. 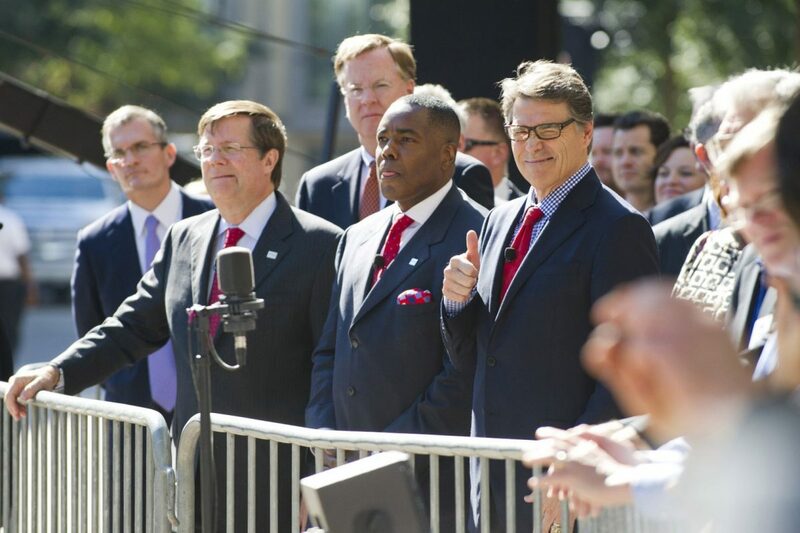 Rick Perry was as relaxed as I have ever seen him when he spoke to the crowd about his experience with Toyota, noting that he began his governorship during the negotiations for the San Antonio project and would be ending it with the Plano project. Wearing a Toyota-red necktie and signature cowboy boots, Perry put a personal spin on his comments. Jim Lentz, CEO of Toyota Motors North America, showed off his boots, reminded the crowd that he had been a Texan before, and even showed a photo of the home that he and his family have purchased in the area. 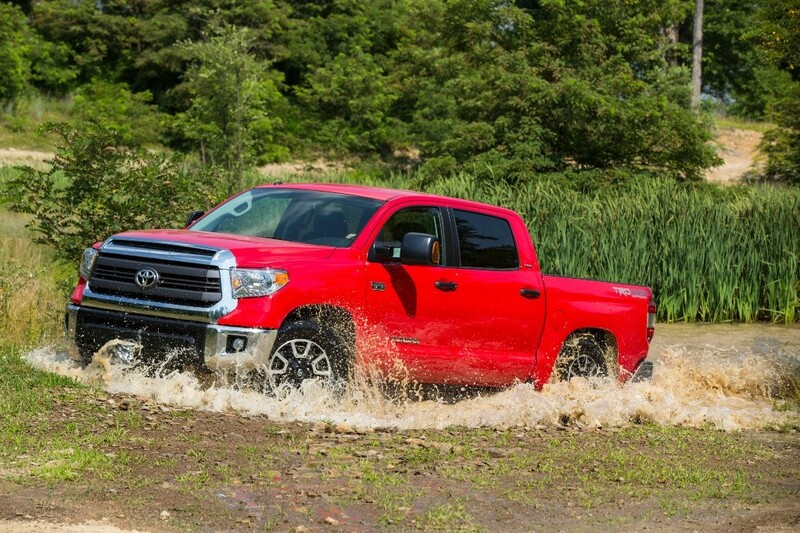 Lentz also announced that Toyota was giving six Texas-built Tundra pickups — in red, white and blue — to the city. 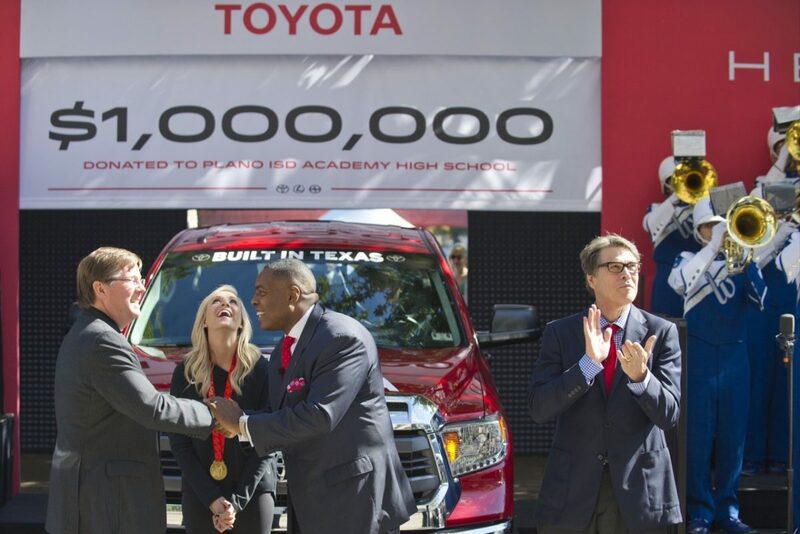 In addition to the vehicles, Toyota gave an even bigger gift to Plano. With Olympic gold medalist, Nastia Liukin, Lentz announced a $1-million gift to Plano ISD Academy High School, the local schools that focuses on science, technology, engineering, arts and mathamatics, also known as the STEAM program. Liukin is a graduate of the Plano schools. Toyota says that it has made $15-million in contributions to the state, and has made investments of $4.4-billion.